Setting up your handle height correctly is sometimes often overlooked but is an integral step in creating your perfect ride whether you’re hunting aerodynamic gains or a more comfortable ride. Before making a start, you should account for things like your bike’s geometry: a bike with a short head tube will naturally place the handlebars on a lower position, and vice versa. So just because you had all the spacers removed on one bike, it doesn’t mean the same applies to another. Signs your handlebars are too low include numb hands and soreness in the lower back. If you’re making adjustments as a result of discomfort, the amount of pain you’re suffering from should also be understood. If you’re suffering a little soreness from a curved back this article should help you but if you’re in pure agony when riding we suggest seeing a professional bike fitter. Getting that perfect fit can be determined by a few different things. Firstly, what do you want to get out of your riding? Are you a long distance rider who values comfort or a racer who wants shave seconds off your personal best? Generally – if you’re after comfort, you’ll want a slightly higher position, if it’s aerodynamics and speed, you’ll wan’t to be lower. But bear in mind if you go too low for your level of core strength and flexibility, you’ll throw off your balance, producing less power and thus going slower. If you’re looking for a more comfortable position for those longer rides you may entertain the idea of a more upright position, so a higher handlebar height would be a good solution. Alternatively if you’re racing, you’ll want to drop the handlebar height to a point where you’re low enough but not in discomfort. 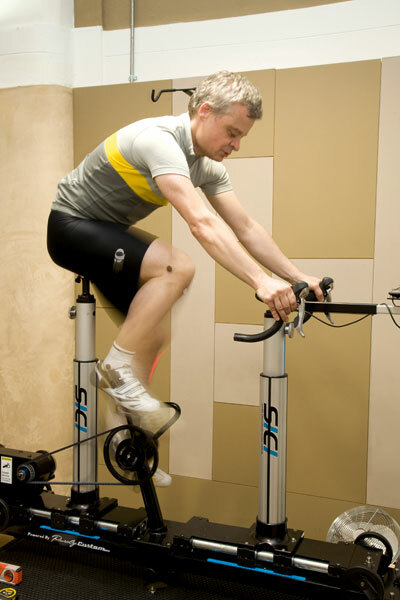 A good way of doing this would be to get a bike fit where they can measure your body to the outcome you want. Unless you’re very serious about getting that perfect height, bike fits can be a bit expensive so don’t worry. A simple case of listening to your body when running a few different heights will give you a good indication as to what is a good height for you. Now that you know what height you want it’s simply a case of rearranging your existing set up. First you’ll want to unscrew your stem cap bolt, usually situated in the centre of your stem cap. Once this is removed you can undo the bolts securing your stem to the steerer. Now that your stem is loosened, you can lower it or make it higher using your spacers. If you want a more aero position you may find yourself removing all the spacers and placing them on top of your stem giving you a lower position. The opposite will be true if you want a more upright posture, seeing more spacers being placed under the stem to give it a higher position. Now that you’ve adjusted your set up to your needs, you can go ahead and tighten everything back up and be on your way. When doing this, make sure your handlebars align in a straight position so as to not affect your steering. A final point to note is that when tightening screws, it’s best practice to use a torque wrench to get the correct tension, preventing overtightening and failure. When doing so, be sure to tighten each screw to the same torque, giving an even fitting across all your screws. For the most part this should help alleviate any past problems but if you find that you are still suffering we recommend a visit to your local bike fit who will be able to go into more depth with analysis of your riding position. The height of a cyclists handlebars has long been a conversations just as concerned with fashion as with function. We discuss the attitudes around handlebar height, and the different elements involved in finding the perfect fit. Long and low might be fashionable – but is it right for you? It used to be so easy. You’d receive a shiny new ‘racer’, for your birthday, as a prize for a satisfactory exam performance or perhaps to ease the burden of the paper round and the first thing you’d do was shove the handlebars as low as they’d go. Racer-style, see? >>> Should you slam your stem: yes or no? Provided the machine never travelled more than a few miles at a time, and few did, this rash act would be of little consequence. Low bars, especially when paired with the non-cyclist’s usual reluctance to raise the saddle to an effective height, mattered little. The fortunate few – those youths, that is, who somehow found their way into a cycling club – would be shown another way. The true path to riding comfort would be explained by one of the club’s many old hands and, assuming the racer turned out to be roughly the right size, the saddle would be raised to what looked like an eye-watering level. Up would come the handlebars to match. The resulting position was invariably ‘racy’; what young person would join a cycling club unless to have a crack at competition? But it would, over time and under the tutelage of experienced eyes, be fine-tuned into something fast and comfortable, something suitable for the road. Today? The modern road rider is as likely to be 40 as 14 years old. This places its own limits on the apish urge to slam the bars, but the real restriction on such fun comes from two sources: the growing influence of the bicycle fitting session and the recent advent of the killjoy ‘sportive’ riding position. It is entirely possible that the two phenomena, which are almost exact contemporaries, are inter-related and that the adoption by the cycle industry of ‘compact’ frame geometry has so befuddled the business of ascertaining frame size that even experienced cyclists are not truly happy until their posture has been adjusted following an exhaustive session of video analysis. That’s not to say that such sessions aren’t an effective way to assess the matter. For the most part, they are – precisely because they are founded on time-honoured principles made more rapidly applicable through the use of advanced technology. They take the waiting out of wanting a comfortable riding position. And ‘comfortable’ is the keyword; nobody wants to be uncomfortable. Discomfort is the fear widely associated with riding on handlebars placed too low. Riders are fearful, perhaps, of pulled hamstrings or displaced rotundity; few older riders will complain of discomfort if their bars are high and close, so that’s where they so often end up. The industry counterpart is the ‘sportive’ position. Beyond ‘moderately upright’, exactly what this is supposed to mean is unclear. Are all cyclo-sportive riders equally indifferent to speed? Are they all happy to potter along peering over uncut hedges? Surely not; in every event this writer has ridden, a good percentage of participants are bent on getting around as fast as they can. Many, it may be said with confidence, look capable of riding in a road race bunch. Some might even be, of all things, competitive cyclists taking time out from real racing. Devoid of real meaning, the ‘sportive’ label typifies the tendency to find sub-categories within any activity, but it does have one attraction: it allows the less ambitious road-person the emotional comfort of having the word ‘sport’ inserted somewhere in the description of their shiny new mount. Which is great, but the least the sportive bike owner could do is actually get down on the drops. There is, after all, not much point in having them unless they get used. And, in this, the sportive bike owner has much in common with today’s version of the young handlebar slammer. While the former is content to grasp handlebars placed high enough to clear a large wicker basket mounted over the front wheel, the latter cannot be seen riding a cycle with even the slimmest of spacers under the stem. Sometimes it’s not really deliberate. The high-handed rider may have inadvertently bought a ‘sportive’ cycle, while far too often the irresistible urge to emulate the professional racing cyclist has its way. Being flexible and keen to achieve the most aero riding position possible, the young chap (invariably) simply discards the spacers supplied with a frame and bangs the stem as low as it will go. This act is generally accompanied by the intemperate shortening of the steerer tube to a length that obviates the fitment of the spacer above the stem, the one that maximises system reliability. Such an extreme handlebar placement may well suit some of those who adopt it, but others find they can’t ride on the drops for longer than a few seconds. This is all very well if the only time they get used is when finishing in the bunch at the end of a road race, but it is a waste of perhaps the most important attribute of dropped handlebars – they are there to offer a range of hand positions, one of which puts the rider in a wind-cheating crouch. To be of any use, it must be sustainable, and to be of any point it must get used. I blame Greg LeMond. By using elbow-rest triathlon handlebars to beat Laurent Fignon on the last stage of the 1989 Tour de France, LeMond effectively killed off the use of road bikes in time trials and thus deprived the world of competitive road cycling of its most compelling reason to perfect the art of riding on the drops. Back when it was usual to ride time trials on drops, those wishing to maximise their average speed had little choice but to find a sustainable position. There were, of course, wide variations in trunk angle, the most important metric; those blessed with exceptional flexibility might well ride with an almost horizontal back, while others – Jan Janssen on his way to winning the 1968 Tour de France comes to mind – struggled to get as low as the more ambitious of today’s sportive riders. But they all rode comfortably on the drops for extended periods. If using the drops isn’t possible, there’s not much point in having them. Equally, if the owner isn’t looking to cheat wind resistance and doesn’t bother, there’s not much point in having them. 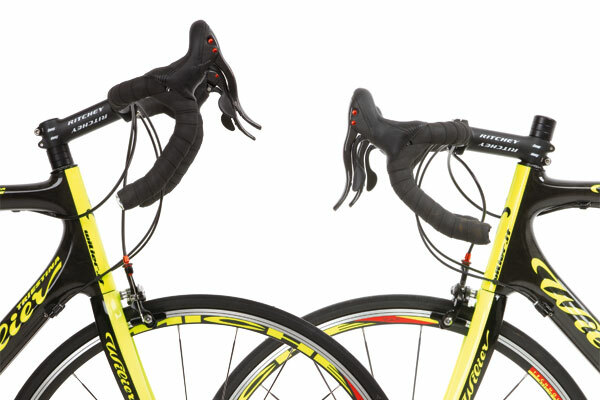 In the latter case, flat handlebars would surely be a better choice. There is, of course, nothing wrong with riding around on a bike that only gets partly used – many smaller sprockets see little use – but those who don’t use the drops because they see no need should at least give them a go. If they turn out to be too low and far away, perhaps another fitting is called for. If they’re not, why not use them more? On the other hand, it may well be that even a youthful, elastic body won’t let its owner comfortably reach the freshly lowered drops. There’s a cheap and easy solution: move the brake levers up and back so they are easy to reach when on the ‘tops’. This is, in fact, the giveaway; the fact that the brakes then can’t really be used properly when on the drops is irrelevant if the drops themselves are perforce left idle. Incomprehensibly popular despite its limitations, the six-shooter brake lever set-up is, as with any variation possible within the limits of component positioning, entirely up to the user. Sean Yates famously prefers his levers slumped low on the bend, making them easy to reach on the drops but less so from the tops, and does so because he likes the straight-arm hold they offer when riding out of the saddle. But the efforts made by manufacturers to create ergonomically effective levers and hoods are largely wasted if they aren’t put where they can be used correctly, which means from both tops and drops. And that means being comfortable with the hands in either place. It’s actually very easy to arrive at a starting position. Assuming correct bike size, saddle height and setback, place the bars so that, when the hands are on the drops, the trunk is at around 40° to horizontal. The upper arms should be at 90° or thereabouts to the trunk and there should be a slight bend at the elbow. Alter stem length to get the correct upper arm to trunk angle and adjust bar height to find the lowest position you can use comfortably for an extended period. So what if it’s not very low? You are still able to use the drops when you need them. And how do you know your bike is the right size in the first place? Hmm. That’s where a fitting comes in, these days. Saves buying a sportive bike when what you really need is a racer, don’t you see?